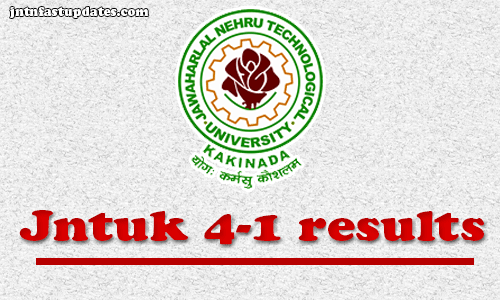 JNTUK 4-1 results 2018: Jawaharlal Nehru Technological University Kakinada (JNTUK) has successfully organised the B.Tech 4-1 Sem (R13, R10) Regular/Supply Examinations in October/November Months. Many of the students undergoing their B.Tech 4th Year 1st Semester have appeared for their end examinations. Now, all the students are curiously waiting to check their JNTUK B.Tech 4-1 Results 2018 for all branches. Candidates those have appeared for B.Tech 4-1 Examinations can check their results from the JNTUK official website, jntukresults.edu.in. Students can check the important updates of IV B.Tech I Semester Regular/Supply results from here below. This year in October, JNTUK has conducted the B.Tech 4-1 Examinations for R13, R10 Regulations for Regular/supplementary candidates. Huge number of B.Tech final year candidates were appeared for the annual sem examinations from different branches like Electrical, Civil, Electronics, Mechanical, Computer Science, IT, Auto Mobile, Petroleum etc. The JNTUK announces the 4-1 results for all the 2 regulations. Candidates can download the following results from today. Stay checking the information from jntukresults.edu.in, jntuk.edu.in, manabadi, schools9 etc. JNTUK 4-1 R13,R10 Results 2018 Date? All the students those who have appeared for JNTUK 4-1 October/November Examinations 2018 are here by informed that, the results of R13, R10 Regulations are going to be released soon. Tentatively the results are expected to release in December month. Hence all the candidates can keep checking the official website, jntulresults.edu.in regularly. Official Links to Check IV Year I sem Result: Links are Updated. JNTU Kakinada IV B.Tech I Semester Regular/Supply Examination Results Oct/Nov 2018 Announced on 3rd December and Marks sheets pdf’s have been sent to respective colleges. Students can access their result at respective colleges. How to Check JNTUK 4-1 Results 2018 at jntukresults.edu.in? Look for the ‘JNTUK B.tech 4-1 R13, R10 Results‘ Link in the list of links visible on homepage. The JNTUK B.tech 4-1 results, marks, grade appears on screen. The above-provided information regarding JNTUK 4-1 Results, 4-1 results r13 jntuk and jntuk 4-1 results r13. Still, if you have any other queries, feel free to leave your comment below. 1.2 How to Check JNTUK 4-1 Results 2018 at jntukresults.edu.in? Sir 3-1 lo double registration vasta University like letter pattanu Anni days lo pc and cmm annidays tharvata apply chasukovachu. 4-1 revaluation results plzzz. at least post update about revaluation. Sir please update the revaluation result date.we eargerly waiting for the revlauation results. cant you make the website straight and simple. When will u give rv results…sir.. This is chaitanya Reg Number (13PD5A0409 ) ididnt got marks memos from 2013 onwards . I Require marks memos of all sems softcopies from 2013 to 2018 dec.